Welcome everyone to today's blog hop from the design teams of My Sweet Petunia (MISTI) and Right at Home Stamps. We have some beautiful cards to share and prizes too. There will be a draw of two winners from all the comments on the hop, so please leave a comment on every blog to be eligible. 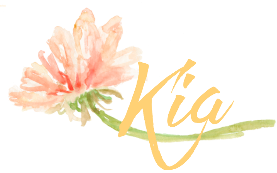 From My Sweet Petunia, winner's choice of an original or mini MISTI, and from Right at Home a prize package consisting of the Sunflower stamp set, Harvest Blessings stamp set (new release) and two Distress Oxide Inks - in Cracked Pistachio and Peeled Paint. 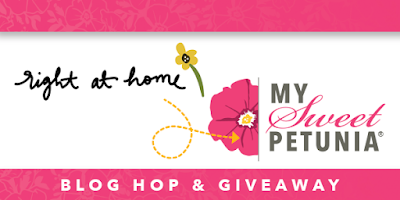 The deadline for your comments is September 8th, noon Central time, and the winners will be posted on the My Sweet Petunia and Right at Home blogs on Tuesday, September 12th. 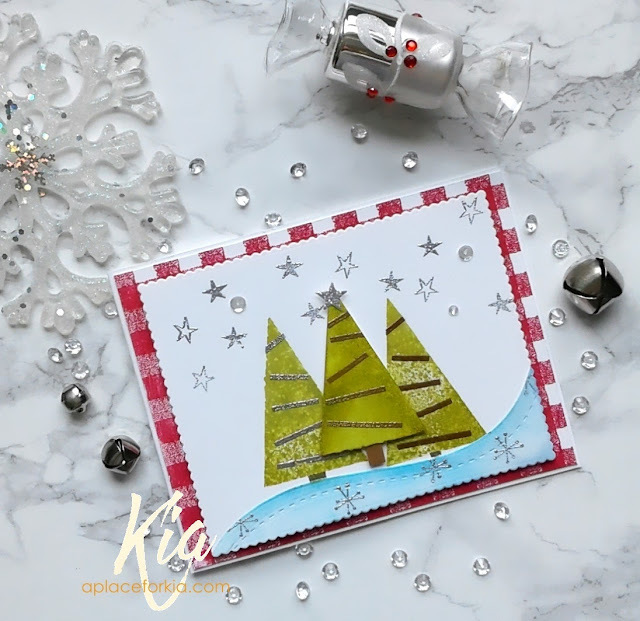 Today I have two cards to share with you, and a video showing the Trio of Trees and Snowman Trio, both made using my MISTI and the Christmas Critters Stamp Set. First up is the Snowman Trio. 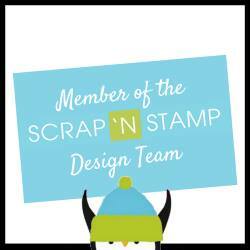 In my mini Misti, I stamped the snowman 3 times, the hat in different colours, and fussy cut all the pieces. I then attached the nose, mouth and eyes to my Misti lid and moved the snowman into place to stamp each. Up next, I added the scarf to the snowmen in the different colours, and coloured in using markers. I sponged some colour to each of the snowman as well as the hats. The panel was die cut using the stitched arch die and embossed with the snow drops embossing folder along with the arch die cut. I sponged on some tumbled glass to the inside of the arch, and attached the middle snowman with glue and the outside snowmen are attached on foam strips. I drew in the stick arms for the snowmen. The top panel is also attached with foam strips. In my mini Misti I stamped the sentiment, cutting and rounding the top corners to mimic the arch. A few sequins and Nuvo Jewel Drops finished my card. Here is a close-up of my card. My second card is the Trio of Trees. and the video showing the details of this card. Following is the list with links of those participating in today's hop. 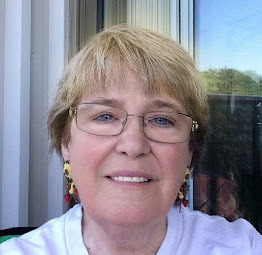 You should have arrived here from Amy Kolling's blog, and next on the hop is Laurie Schmidlin. Thank you for visiting the hop ... be sure to have fun. Products: MISTI Mini and Original, Right at Home Christmas Critters, Gingham Background Stamp, Christmas Sentiments, MFT Die-Namics Stitched Arch STAX, Simon Says Stamp Stitched Slopes and Hills Die Set, Tonic Studio Essentials Mixed Edge Rectangle Layering Basics Dies, Sizzix Embossing Folder Snow Drops, Neenah Cardstock, Silver Glitter Cardstock, Tim Holtz Distress Inks for snowman Black Soot, Tumbled Glass, Wilted Violet, Picked Raspberry, Spiced Marmalade, Altenew Caribbean Sky and Coral Berry, for Trio of Trees, Altenew Ruby Red, Tim Holtz Distress Inks Crushed Olive, Salty Ocean, Tumbled Glass, Silver, Copper, Gold, Embossing Powder, VersaMark Embossing Ink, Sequins, Nuvo Jewel Drops, Foam Tape, Foam Dots. What fabulous little trios ... the love the colors for your snow people. Your cards are so adorable love them. Your cards are so cute. The designs are delightful and fun. Love your holiday trios - super cute cards! Oh my gosh! Those snowmen!!! Those are so very adorable! Love it! Sorry for all the !!! ...can you tell I TEALLY LOVE those cards? LOL Thanks for sharing. Gorgeous cards! Love the snowmen. Snowmen and trees and a Misti that makes ease! Love your delightful cards! The snowmen are adorable! Great textures and colors! And the trees are beautiful! Lovely winter scene! Love both of those cards. 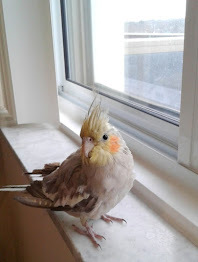 So cheerful! Fun cards! Thanks for sharing! Awesome cards. I specially love the snowmen, they are so funny ! 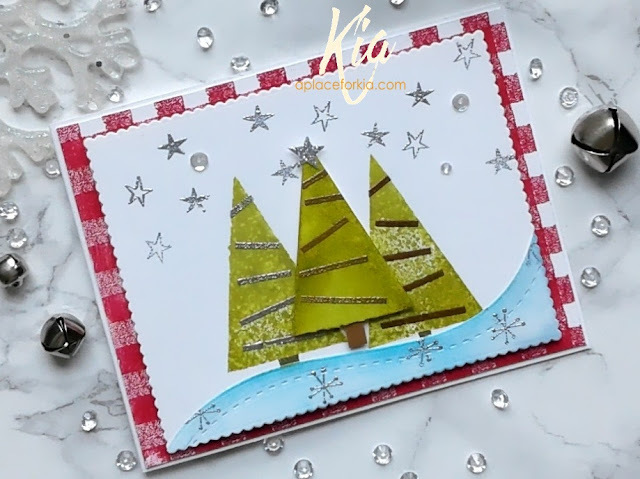 Such a great card Kia, love the gingham background and the trunks do add a finishing touch to the trees. Well done. A great card Kia. Very nice job! Love the snowman trio colors! Wonderful details on both cute cards! Thanks for showing crafters about the Misti. I love mine! Love your wonderful cards. The snowmen are adorable. These cards are wonderful! I especially love the snowmen card, its adorable. Both of your cards are so cute! I especially love those cute snowmen! The snowman are so adorable! Pretty Christmas cards. Love the holiday inspiration - always looking for great ideas and these are adorable! Great trio cards - especially love the snowmen in their lovely colors ! OK Now I'm in holiday mode! Beautiful cards! Two trios of terrific, Kia! I love snowmen!! 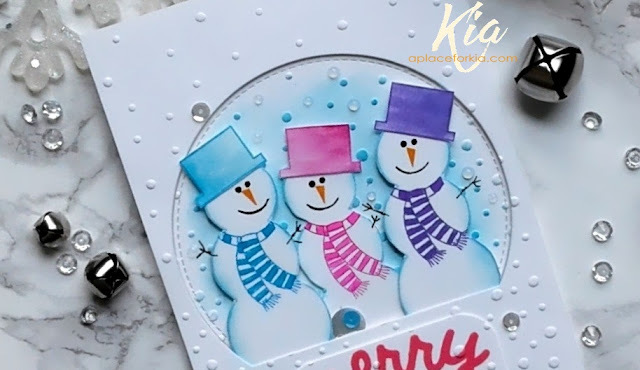 !Its so neat the embossing to look like snow.So cute !Thank You for sharing. Both cards turned out wonderful. The snowmen are adorable. Thanks for the inspiration. Cute and colorful trio cards. Those snowmen are adorable, and I love the trees as well. Great holiday cards! Great Christmas cards! Especially loving that trio of snowmen!